This is a series of NASA Moderate Resolution Imaging Spectroradiometer (MODIS) satellite images taken over a 10 year period, 2000-2010, showing the extent of deforestation in the State of Rondonia in western Brazil over that period of time. 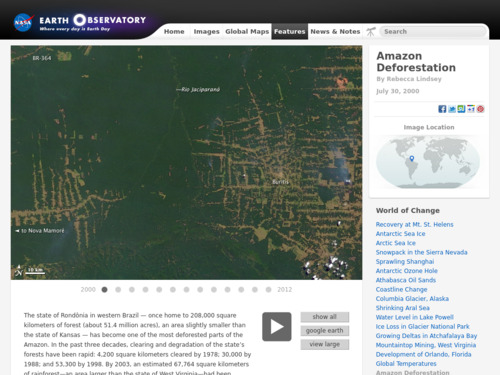 This interactive can be used in any lesson dealing with the Amazon in Brazil, using satellite images to detect deforestation. Suggestion of how to use visualizations: show the images to students (without the explanations) and ask them what they see and what they think is shown before reading the text and explanations. Have students use the scale bar to figure out the area shown in the image. Discuss the interconnections between different spheres. Use the image to discuss the carbon cycle. Images and accompanying text illustrate deforestation in the State of Rondonia in western Brazil. Collection of the data via MODIS and Terra Satellites is discussed. Comments from expert scientist: This webpage provides a clear examination of Amazonian deforestation. The imagery/content is accurately conveyed and the dates chosen (2000 - 2012) are relevant for current readers. Scaling the deforestation extent to the size of a US state is appropriate for an American audience and helps contextualize the information. The Nasa Earth Observatory article that accompanies this series of images fills in context for understanding the relationship of deforestation to climate change. Images are very dramatic and easy to understand; text accompanies the series. Google Earth KMZ file helps visualize the area shown in the images. Comparison of size is given in the background article.